Dragon Sky is an online action role playing . The dragons of legend are strangely like actual creatures that have lived in the past. Dragons are much like the great reptiles which inhabited the earth long before man is supposed to have appeared on earth. Dragons were generally evil and destructive. Every country had Dragons in its mythology. choking chemicals from erupting volcanoes, climate change and possibly other factors. But now we know that the Age of Dragons never ended. Fortunately, Scientists found a way to make dragons alive from a DNA particular found in an ancient dragon's egg. This is no longer a dream with The Dragon Sky. In all levels of The Dragon Sky, you are born hatching your dragon egg. helicopters much more of these mentioned here are all against you. Moreover, your own species, you know Dragons are also against you. As a result, you are alone. While being fast, you should hurt and kill your enemies. This will enable to unlock other levels in the game. You must collect survival packs and power-ups to improve your health status. In the lake level, there is a marvelous lake in which fishing ships exist. Also, there are historical coastal guns, helicopters and huge spiders attacking your Dragon. I bet your Dragon will love it! In another level, there is a desert atmosphere where war tanks, war helicopters attack your Dragon. Note that, enemy dinosaurs are more aggressive at this level so protect your Dragon as possible as you can do. There is also a futuristic science fiction level which having amazing space atmosphere with robot insects. In all levels, go over the collectibles such as meat, snowflake, star, etc. to enable new features, become faster or heal your Dragon. When there is huge number of enemies, behave brave and attack or run away from them as fast as you can. Watch your back and be careful to not get bitten! There are real enemies chasing you! In this way your game last longer and you will beat all records! Do not let the power bar of your Dragonsaur get empty and try to maintain the energy bar at its fullest! You can also watch Rewarded Ads to enable special weapons and power-ups! 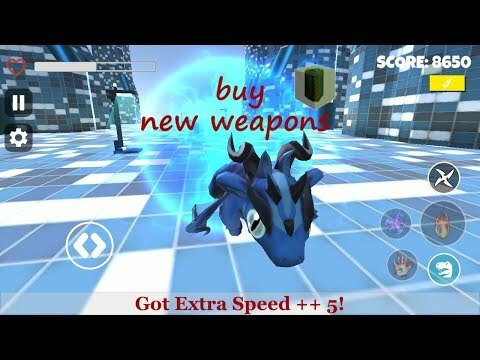 Make your own Dragon story real with Dragon Sky! -fire gun, electric gun, big bang bomb magic circle etc. ◉ Ideal for children (Boys & Girls)! Please note: Dragon Sky Game is completely free to play but offers some game items for purchase with real money. We hope you like this game and look forward to receiving your comments and ratings!